Asparagus season is quickly coming to an end here in Colorado. I find that asparagus is one vegetable I insist on eating only in season. Other vegetables I often let slide and eat a few here and there. Corn and asparagus are two I refuse to buy off season, though from somewhere, we seem to have them available all year round! Until last month, I had never tried a truly, local grown asparagus. Let me tell you in one word, wow. In Texas, I shopped from a local farm but they didn’t grow asparagus. I don’t know if asparagus can be grown in Texas! This farm had Southern specialities like all kinds of fresh beans, fried pies and then your usual farm fare. So, as long as local, Colorado grown asparagus is available, I’ve been rushing to the farm every week piling up on the grassy goodness. I have never tasted asparagus this sweet and perfect. Store bought asparagus is absolutely no comparison. My most recent visit, I grabbed two bunches of perfectly, green, crisp asparagus spears. I had no idea what was planned for these beauties but I knew they would be the highlight of my dish. 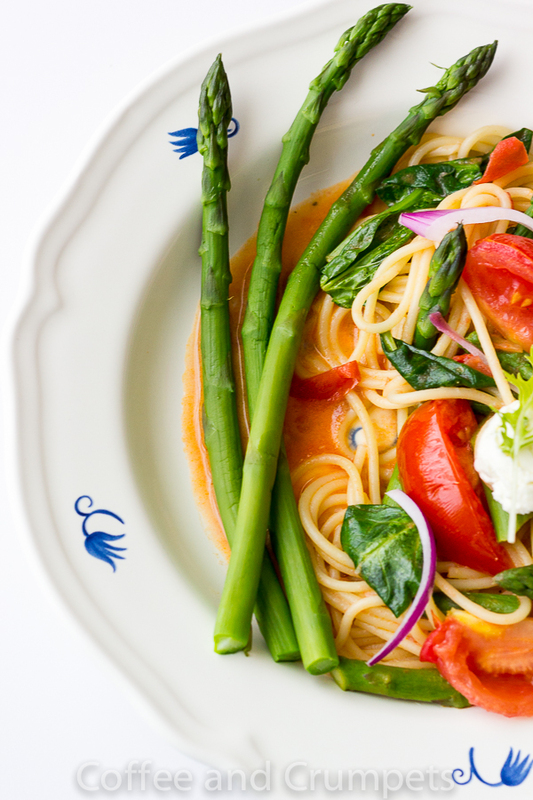 Pasta Primavera is one of my favourite springtime dishes. It’s substantial enough for lunch and dinner, versatile enough to use up what you have in the fridge and light enough to not bog you down in the warmer months. I loaded up the pasta with the fresh asparagus, a light tomato cream broth and a handful of spinach. 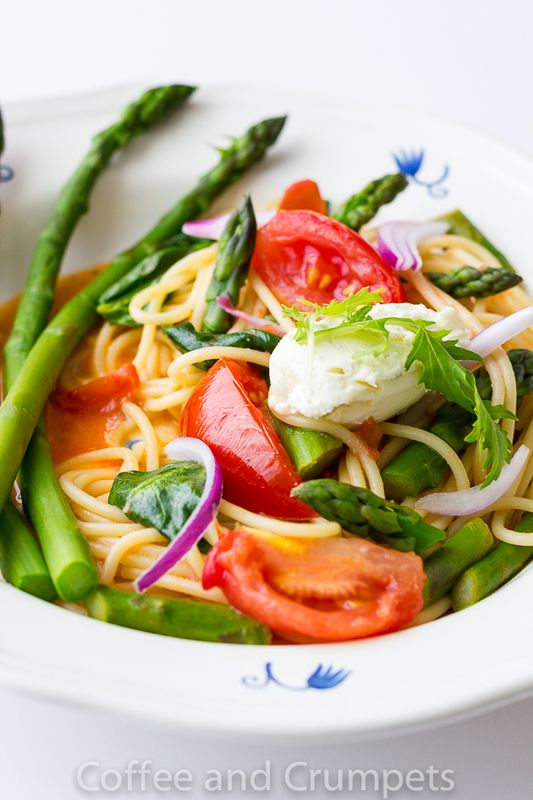 Asparagus Pasta Primavera is the perfect dish to highlight the sweet and tender asparagus against the neutral pasta. It is so good. If you can still get some asparagus, make this! I used whole tomatoes in this dish because I had a bowl of organic tomatoes that urgently needed to be used up. I, usually, like cherry or grape tomatoes in my primavera. I like how they heat up, pop and release just the right amount of juice; mixed with the olive oil, garlic and a drop of cream and a splash of pasta water, it makes a perfect sauce. I blanched my asparagus in salted water because I wanted the green colour intact, but you are welcome to just sauté them and build your sauce from there. Also, this pasta dish is vegetarian, but I’ve made many primaveras with chicken or sliced sausage; so good. Great thing here is; you don’t need a lot of meat because it is vegetable heavy. 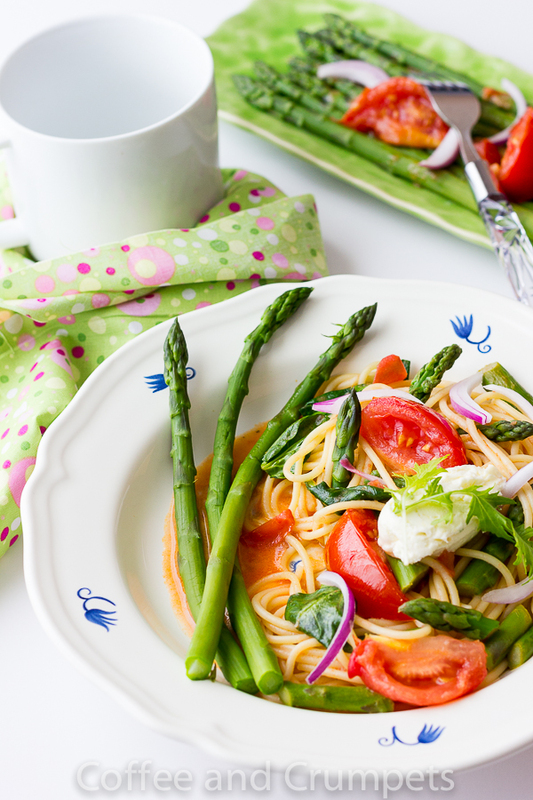 Spring recipe highlighting fresh asparagus tossed with pasta in a light tomato cream sauce. Start by boiling some water in a big pot to blanch the asparagus. If you want to just sauté the asparagus instead, then skip the blanching step. When the water is boiling, add a teaspoon of salt, and add the asparagus. Simmer for no more than 5-7 minutes. Remove from the boiling water onto a bowl of cold water to stop cooking. Chop the asparagus in medium bite size pieces. In a large sauté pan, heat the olive oil and add the garlic. Let cook for a minute and then add the cherry tomatoes, or chopped whole tomatoes. Let the cherry tomatoes cook and pop and release their juice. Cook the pasta according to the package directions, pulling them off one minutes shy of being done. Drain the pasta reserving a cup of pasta water. Add the coked pasta to the tomato sauce in the pan. Toss around and add a bit of water if needed. Add the asparagus, the spinach, herbs and heavy cream, if using. Toss until the pasta is cooked and coated with the light sauce. Add as much pasta water is needed to loosen the pasta. Sprinkle with Parmesan cheese and toss through and serve. I hope everyone has been enjoying the lovely summery days we’ve been having. I have to say though, it’s getting a little too hot, a little too quickly! Last few days in Denver have been very hot. I don’t do hot. I envy all the Southern Hemi people enjoying autumn. I’ve been trying to make my rounds and catch up with my blog reading but it’s been slow going. I haven’t forgotten you! I am just moving so slow that it takes me twice as long to do anything which means I have no time left at bedtime to catch up on my reading! Imagine how long it’s taking me at the grocery store! So, I’ll be by to see you all. This week has been hectic all around with the kids last week at school and all their activities. I have to say that they made me proud. After all the screaming I do during term time, and all the non listening they do, I am surprised they finished the school year like they did. My eldest daughter finished her first year in college with an all A report card, my second daughter finished 11th Grade with a 4.0 GPA and my youngest daughter graduated 8th Grade with Excellence in all classes, I am chuffed (#proudmama). As for Laith, well I’m just happy he got up everyday for school and made it there on time! Delicious asparagus dish, it looks so fresh and inviting! Wonderful dish! I love that it isn’t cream and cheese heavy, thus making the pasta and vegetables the true stars of this dish. Unfortunately I haven’t been lucky enough to try locally grown asparagus, and the kind I find at the grocery store just tastes so blah. iA once I get back home I’ll look out for some that are locally grown! Such a beautiful, vibrant dish Nazneen – the good thing about asparagus here is that when it’s not in season you can’t actually buy it. Not like in France where it was shipped in from the giant plastic growing tunnels in Israel or Spain year-round. So like you I only get it in season, and I would certainly never buy tinned asparagus – bleurgh! 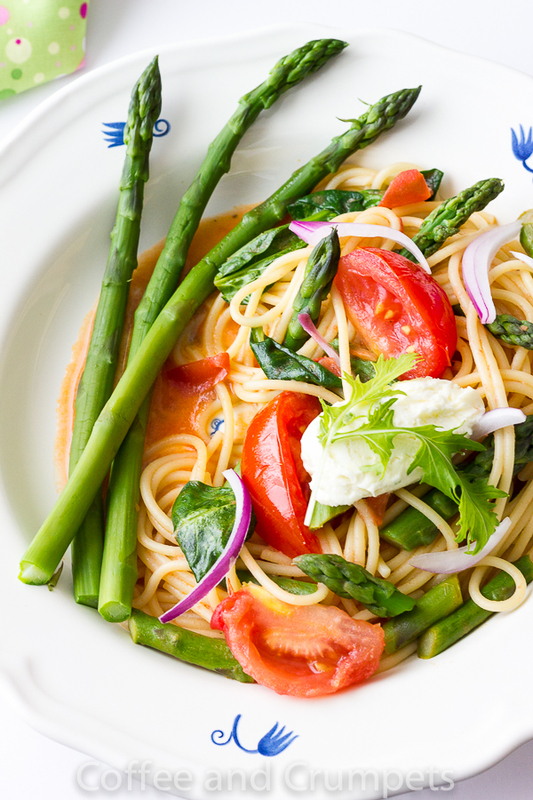 Beautiful summery pasta! I love asparagus but I usually cut into small pieces. After seeing this photo, I would love to try serving some of them uncut. Very very pretty! Love the light pasta like this when we have hot weather. Spectacular dish! Thank you Nami! I love uncut asparagus, they are so beautiful. My son wanted all the big ones and I had to stop him from eating all our dinner! Thanks Holly! It was very good! Nazneen, so glad to hear that your children did so tremendously well in school – you must be very proud indeed! 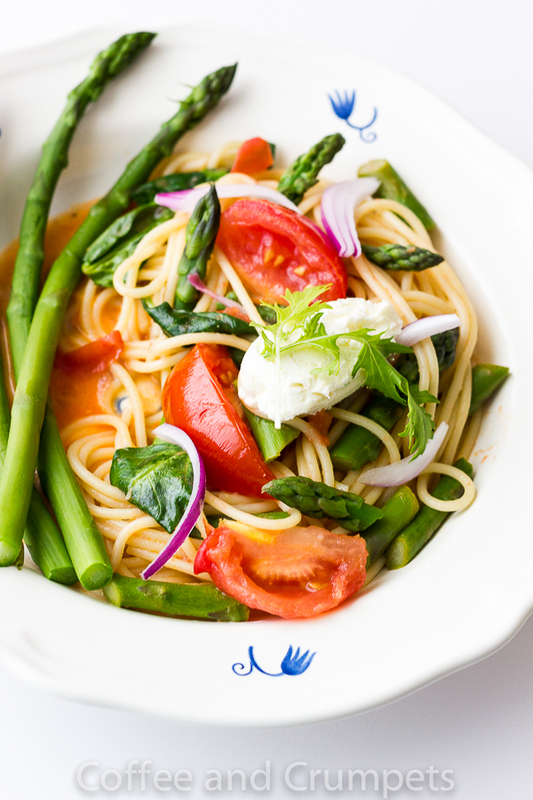 As far as your pasta primavera is concerned, it looks absolutely wonderful – a true delight on a plate. Local asparagus is just the best! Hope you a had a great birthday and most of all that you are feeling much better very soon! Exactly as you, I eat asparagus just in season, even though I love them, no metter where. Your pasta looks really yummy, as you can immagine my pasta recipes, according to Italian tradition, are really classic, but I’m really curious about new and original recipes! Thanks for sharing, hope you’re well. Have a great we! This looks so bright and full of lovely goodness! Yum! Happy Birthday in advance! I hope you have fun and fabulous day tomorrow.I will be missing out on the Colorado summer bounty but I know you will keep posting about it. Everything about this pasta dish screams our fresh to me! And can we talk about how amazing your pictures are? Honestly, they’re stunning! Asparagus is my favourite spring veggie. I love how fresh and delicious this pasta dish looks! S your children are smart as well as beautiful? And I’m assuming that your oldest will eat this! You are right about asparagus. We had a patch when we first moved into our house and they were so good. But your photos are what have me drooling. Please help! One word…s-t-u-n-n-i-n-g!!! Just wow for a pasta dish. You are so right about asparagus. But I will admit that I had some great luck with that vegetable off season at Whole Foods. But then I don’t look as deep s you do. This is gorgeous! This looks so beautiful and fresh! What a proud mama you should be! Now I don’t feel bad with all my nagging and carrying on during the year to get the kids doing what they need to be doing. One day they will appreciate all that carrying on. Well I hope so, don’t you think? This is one grab eye gorgeous dish Nanzeen. Love those colorful vegetables. I love these kind of comfort dishes. Just pinned! I miss tasting and eating asparagus, to the contrary to what I used to think about the veggie as a kid. 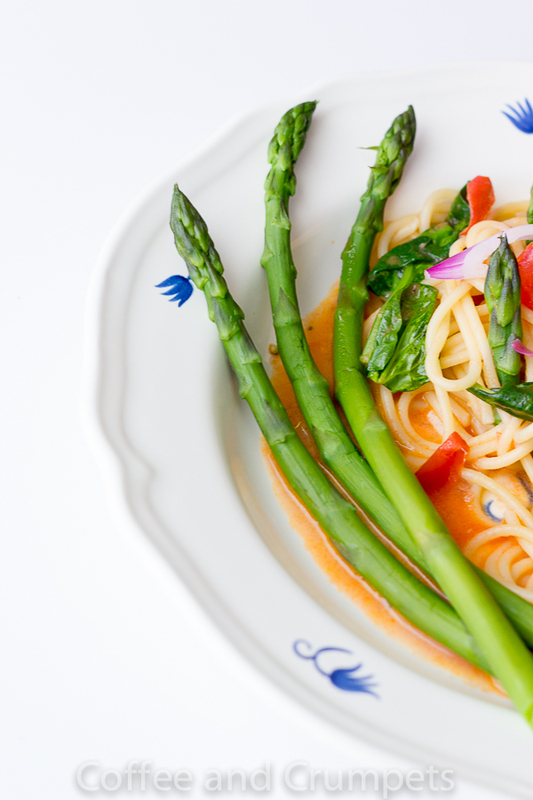 Nothing beats fresh seasonal asparagus and a pasta dish of it is even better. There’s really nothing like local asparagus, is there? I always do buy some of the asparagus imported from Peru right at the beginning of the season — because I’m so craving it! — but you’re right it doesn’t compare. Anyway, great dish — asparagus works so well in pasta. You definitely need another pasta machine. I don’t use mine every week, but I do use it a lot. Good stuff — thanks. Wow! Such a fresh and healthy dish, Nazneen! Absolutely stunning photos as well. Love this post! I agree with you about in-season. I feel the same way about asparagus, corn, mangos and most stone fruit and berries. Thankfully where we live things can be grown nearly all year so it’s only mangoes and asparagus I have to wait a long time for. I think we should swap houses and seasons! You come here and I’ll come to Australia! Only bad thing is, we wouldn’t see each other. This just looks straight-up delicious! It’s beautiful and looks so vibrant and fresh. I have been buying a lot of asparagus at the farmer’s market and I just can’t get tired of it. Things are so much better in season, aren’t they… Hope you are feeling loads better. Take care. Thank you, Monica! I’m getting there, I have good days and bad days but I try to be positive! Your pasta dish sounds wonderful and with your gorgeous photos, who could resist making it. Thank you for your lovely comment, Karen! What a great composition dish in terms of colors, textures, and flavors. It looks delicious, fresh, and comforting. It is so interesting… My children asked me to buy asparagus recently. I am thinking to surprise them with this pasta. I hope you are feeling better, Nazneen! Thank you, Denise! I think the girls would like it because it’s pretty mild and sweet mixed with pasta. Let me know what they think! HOLY WOW!! I want a plate right now please! You’re funny, Candy! Thank you for your comment! I’ve never tried the creepy white stuff, but I sure do like the green one! Thank you, my dear Francesca. Thank you Danielle for your lovely comment! I knows the UK goes crazy over asparagus season, I hope you get your fill before it disappears. Beautiful photos Nazneen! I could grab a fork and eat this gorgeous dish. These asparagus look so good – so fresh, adding them blanched to the dish not only preserves their gorgeous color but also their wonderful crunch – such a lovely dish Nazneen!! Thanks Shashi! They were such a gorgeous colour when I bought them that I didn’t want to ruin it by cooking it! These asparagus look so good – so fresh, adding them blanched to the dish not only preserves their gorgeous color but also their wonderful crunch – such a lovely dish Nazneen! Shelley @ Two Healthy Kitchens recently posted..Mini Deep Dish Pizzas + Dessert!